I, Holly, love a good cocktail and a good pun. After starting to mess around with new cocktail recipes these last few months, I started collecting pretty shakers and there was just one thing missing…puns! Naturally, shaking up a cocktail always makes me think of “Shake it Off” by Taylor Swift, so I thought it was the perfect line for making a simple punny cocktail shaker. With some colorful vinyl and my Cricut machine, this was really simple to make and adds a little humour to my drink-making. Vinyl is a great craft supply for a variety of projects, and even though I used a cutting machine, you don’t necessarily need one. Just keep in mind it will require more work to cut with a knife. 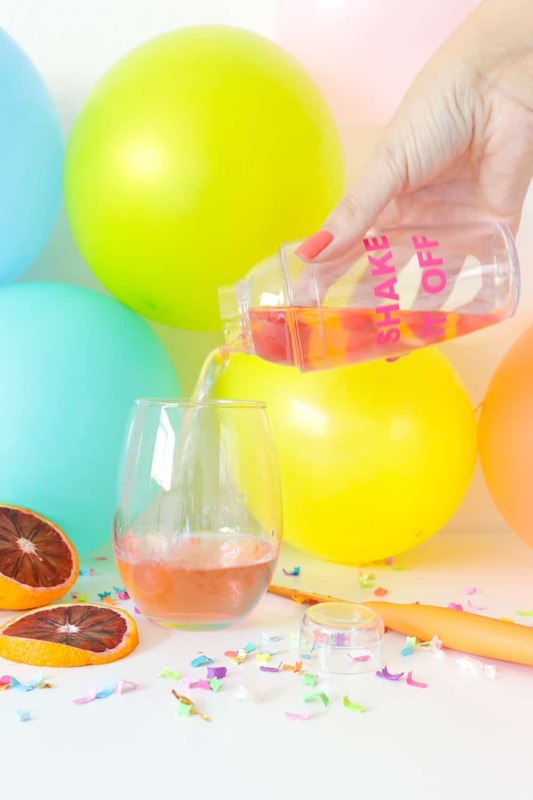 Here’s how to make a punny cocktail shaker of your own! Wash and dry the shaker first. Type out the saying in the Cricut design program and cut on the vinyl OR use a small stencil (keep in mind the size of your shaker) to lightly cut the letters. When cutting vinyl, you do not want to cut through both layers – only the colorful sticker layer. Once the letters are cut, remove the outlined area and weed the middle of the letters so only the words that you want remain. Cut a piece of vinyl transfer tape the same size as the saying. Remove the backing and place sticker side down on top of the saying, smoothing out. Carefully peel back the sticker so that the saying peels off with it in one piece – this step ensures your letters stay in place and you do not have to individually place each letter. Place the sticker in the middle of the cocktail shaker and press with your fingers until completely smooth. Carefully peek back the clear layer, leaving only the saying pressed to the shaker.